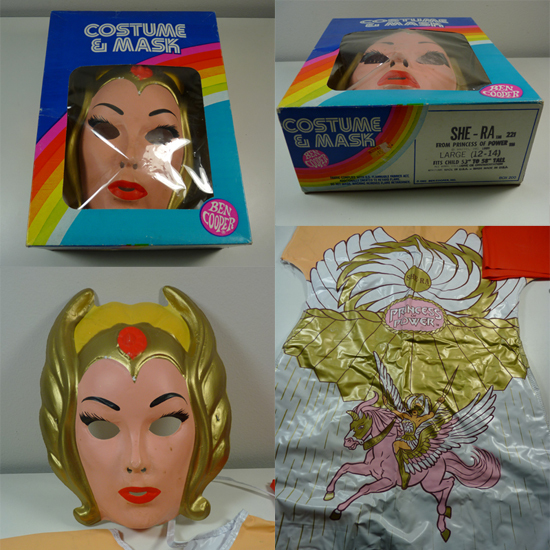 A few months ago, a guy who owns a comics and collectibles shop- knowing that I'm always looking for She-ra items- pulled out this costume and mask set. I didn't know anything about Ben Cooper costumes at the time, and honestly, the mask creeped me out a little. So I passed on it. After that, I started noticing more of these Ben Cooper costumes on eBay and other blogs and forums I read. Curiosity caught up with me, and a quick search of the interwebs taught me that the company (started by a theater costume and set designer by the name of, yes, Ben Cooper) starting making Halloween costumes in the 1930's and lasted into the late 1980's. At a time when Halloween costumes were mostly traditional characters- ghosts, witches, and the like- the company was quick to acquire licenses from popular culture and produced costumes of the most popular movies and television shows at the time. Smart! 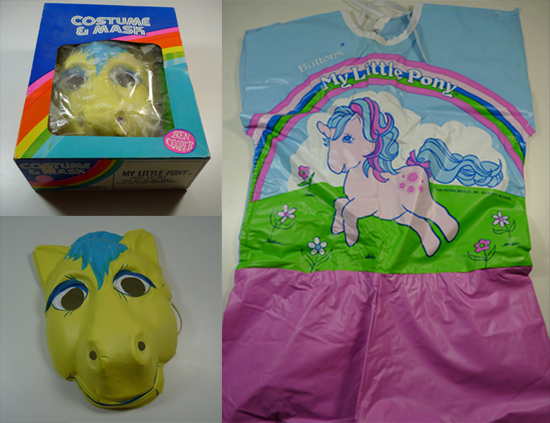 No collector can have just one of anything, so I went straight to eBay and found this My Little Pony costume. I still find the mask creepy, but I just love the look of the classic ponies of my childhood. All I need to find now is the Batgirl costume and mask set, and I'll be satisfied with my little Ben Cooper collection!